Much of the material in this story comes from “Rock Island’s Modernistic Architecture,” published by the Preservation Commission. You can pick up a free copy at the downtown Rock Island library or at City Hall. You can’t help but be impressed by its size. It is huge — 232 feet long, 148 feet wide and 65 feet high, with an interior area of about 80,000 square feet. Then you notice the beauty of its elegant Art Deco style. It is hard to imagine Rock Island’s downtown riverfront without its steel and concrete National Guard Armory. Our armory is very special as well, since it is the largest historic armory outside Chicago. And only ten armories in Illinois are older. 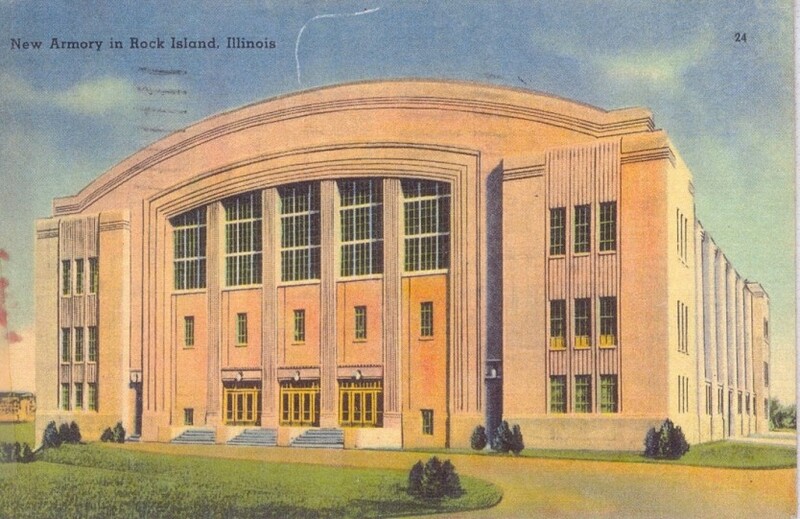 As early as 1928, Rock Island asked for a new armory to replace the inadequate existing armory that was located in the same building as the old City Hall. It took several years, the Great Depression of the 1930s, and Franklin D. Roosevelt’s New Deal programs to achieve that goal. New Deal programs used federal dollars to put the unemployed back to work. Under one of these, the Works Project Administration (WPA), the federal government was in charge of the building programs. A similar program, the Public Works Administration (PWA), also provided funding for community projects but the projects were locally planned and executed. The PWA played a limited role, verifying that construction costs were consistent with original estimates and that labor wages and hours followed federal laws – and of course providing a large amount of money. Our armory was built with PWA funding. With armories being a high priority for PWA funds, Rock Island finally was approved for funding in 1935. When notice of the grant was received, the city council quickly passed an ordinance to sell the riverfront area to the armory committee. Before the Armory was built, our downtown riverfront north of the railroad tracks was a mostly empty public levee. Early photos show brick paving sloping gently to the water’s edge where steamboats would stop. Construction started in early 1936, with Governor Henry Horner present for the groundbreaking. The official designer of the armory was local architect Benj. A. Horn, although it is reported that Chris Maiwald, who had worked for Horn for several years, did much of the actual design. Since the PWA had directed that newly built armories should follow “the newer tendencies toward simplification in architectural style,” it was logical that Maiwald would use the Art Deco model as his inspiration. Actual construction was done by a Chicago contractor at a final cost of $400,000. Governor Horner returned on Armistice Day in 1937 for the dedication. 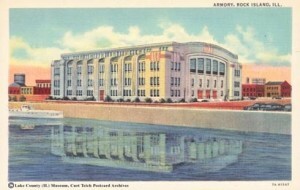 This postcard, which dates from about 1940, is an accurate representation of the armory as it was built. Another, slightly earlier, postcard, published by Curt Teich for the dedication, shows the armory as viewed from the river. However it must have been created from a drawing as it shows details not present in the completed building. Seventy years later, very little changed. The Art Deco detailing gives a very vertical emphasis, even a lightness, to this massive building. A multi-banded arch, with vertical columns of fluting –pilasters — separating the windows surrounds the main entrance area. The banding and fluting is continued along the roofline and on the tower-like corners. Windows on the long sides are arranged in vertical columns. The central part of the building is a single huge space under a rounded or barrel-vaulted roof. There is a deep open drive-in basement here, too, designed to hold heavy military equipment. Another unusual feature is that the armory itself is an integral part of our seawall. When the seawall was built after the flood of 1965, this portion of the wall was built directly into the armory’s structure. In addition to housing several army and navy reserve units, the armory was also an entertainment center for the entire Quad City area, with its stage and central area seating 5000. Events similar to those now held at the Mark – ice capades, circuses, wrestling, concerts, auto shows and more — took place at the armory. Circa 1998, armory functions were moved to a new building in a more rural area, and the armory structure became the property of the city. For a time the interior space was used for Casino Rock Island valet parking. But when the casino moves to a new location near I-280, there will be a wonderful opportunity to develop this historic structure while complementing a revitalized riverfront. The soaring interior spaces with their lack of structural columns are a blank palette, limited only by imagination. What could you imagine happening here? NOTE: The Armory was demolished in 2009 and was replaced with a beautifully planned park, named for long time Mayor Mark Schwiebert. The new park is a rare example of a historic building being lost but being replaced with something that is an aesthetic asset to the community. This article, by Diane Oestreich, is slightly modified from the original, which appeared in the Rock Island Argus and Moline Dispatch on January 26, 2003.